When you're wearing the Descente Swiss Ski Team jacket, you'll be ready to hit the slopes full force, just like the Swiss Ski team. Heat Navi® and 100g of 3M Thinsulate ™ insulation make for an ultra-warm experience. Breath ventilation and Motion 3D Fit technology provide a natural feel while Dermizax NX 20K waterproofing keeps you dry as can be. Skiers will also appreciate the additional storage including a media pocket, inner mesh pockets, and a special pass holder for added convenience. Smart wrist, waist, and hood adjusters make it easy to customize on the go. The stretch liner provides ultimate mobility and comfort. Easily store your pass and other valuables with the pass holder, media pocket, and inner mesh pocket. 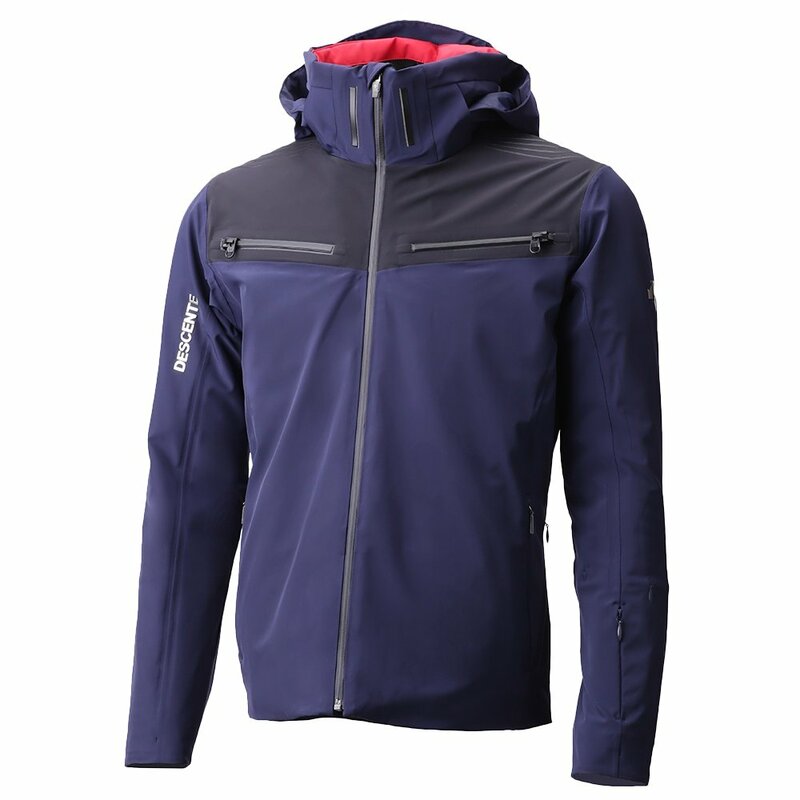 "This jacket is rated as slim in sizing/fit...I now have a Descente mens small regular jacket ... Rogue model...it fits great ...so I'm thinking maybe this Swiss jacket in medium would recommend a similar fit. 39" chest, 32" waist. Height is 5'7"... will this work? " "Thank you for your inquiry. The Descente Rogue is a relaxed fit and the Descente Swiss Ski Team is a slim fit. Based on the given measurements of 39" chest, 32" waist. We would recommend a medium in the Descente Swiss Ski Team. We hope this information helps! " "I am looking at purchasing a new ski jacket and have been looking at the bogner Liam jacket and the descente jacket. I have been wearing the same Kjus jacket for 12 years and I have loved every min in it. My wife wants me to be a little more fashionable. Is the bogner for me or the Descente? Is one much more warm than the other? Are they both equally as fitted? " "Thank you for your inquiry. The Descente Swiss Ski Team Insulated Ski Jacket has a higher warmth rating than the Bogner Liam-T Insulated Ski Jacket. Bogner tends to run smaller than the descente. We hope this information helps!" "What brand has the longest length men's jacket"
"Thank you for your inquiry. To ensure an accurate measurements, we need you to provide us with your size. If you need further assistance please contact us at 800-818-0946. " "Is the hood detachable? " "Thank you for your inquiry. Yes, the hood on the Descente Swiss Ski Team Insulated Ski Jacket is removable. We hope this information helps! " "Do the wrist gaiters have a thumb hole?" "Thank you for your inquiry. No, the Descente Swiss Ski Team Insulated Ski Jacket does not have wrist gaiters with thumb holes. We hope this information helps! " "Does this jacket have the sponsorship patches on it?" "Thank you for contacting us. The Descente Swiss Ski Team Insulated Ski Jacket does not have the sponsorship patches on it. We hope this information helps!" "The item only comes in a "STANDARD" Length of 28.5 inches. "